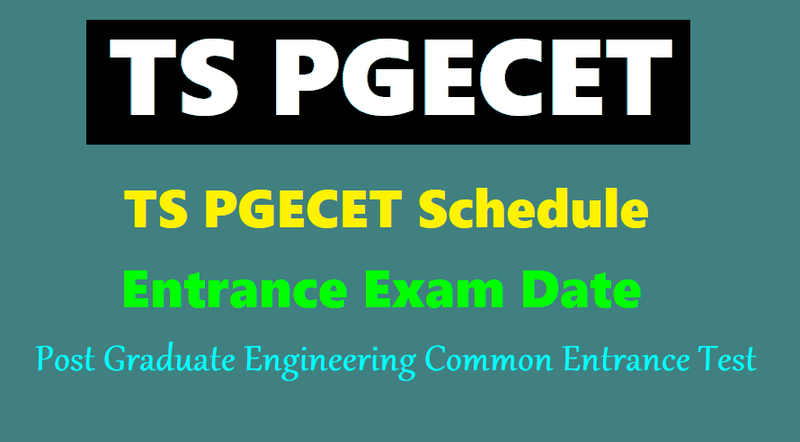 #TS #PGECET 2019 Notification, Schedule M.Tech, M.Pharmacy, Pharma D Courses admissions: Telangana State Postgraduate Engineering Common Entrance Test (PGECET) Notification would be released in the month of February 2019, and entrance examinations would be held between May .... and June ..., 2019. PGECET is a State level common entrance test. It will be conducted by the University College of Engineering Osmania University on behalf of Telangana State council of higher education, a statutory body of Government of Telangana, Hyderabad. How to apply: Eligible candidates who wish to apply for TS PGECET-2019 may submit their applications through online mode only. Registration fee: Rs.1000 (Rs.500 for SC/ ST candidates) per test. Examination dates: 28.05.2019 to 31.05.2019. Mode of Exam: The Exam will be conducted online only i.e., Computer Based Test (CBT). Commencement of online application registration: 13.03.2019. Last date for online submission: 30.04.2019. 129 Engineering Colleges offering M.E/M.Tech Courses, 96 Colleges M.Pharmacy Courses, 14 Colleges offering Pharm-B (PB) courses and 3 colleges offering M.Arch. in the state for the year 2018-19 will be involved in the entrance examination. The TS ICEt Common Entrance Test will be held in CBT (Computer Based Test) mode and will be held from 28.05.2019 to 31.05.2019 in two sessions 10.00 AM to 12.00 NN and 2.00 PM to 5.00 PM at two Regional Centres ie., 1) Hyderabad 2) Warangal. The notification will be issued on 06.03.2019. Osmania University will be invited online application for appearing Post-graduate Engineering Common Entrance Test (PGECET) for admission into M.E / M.Tech. / M.Pharm. / M. Arch. / Graduate level Pharm. D (P.B.) (Full Time) in University and Affiliated Engineering / Pharmacy Colleges in Telangana State for the academic year 2019-2020 as per G.O.Ms.No.54 HE Dept (EC-2) dated: 21-06-2007 and amendments. So, Qualified candidates would be given admissions into M.Tech, ME, M.Arch and M.Pharm courses offered by the colleges in the State. The PGECET officials have decided to introduce textile technology in the entrance from this year making the total number of test papers to 18. They informed that, last year they have conducted admissions directly. But this year, the admissions for text technology would be made through the entrance exam only. The Committee also decided to continue to collect registrations through online. It included payment for the registrations. The online registrations would begin from March 13. and last date for applying without late fee is April 30. With a late fee of Rs 500 and Rs 2000 is May .... and ... respectively. So, Candidates can register at http://pgecet.tsche.ac.in/ or www.osmania.ac.in.by paying Rs 1000 (Rs 500 for SC/ST candidates). The examination would be held from May ... and June .., 2019 in two sessions 10 am to 1 pm and 2 pm to 4 pm. The results of the test would be declared on .....06.2019. The examination would be held in two regional centres, such as Hyderabad and Warangal. Officials have arranged 40 test centres in two regional centres. According Venugopal, the pattern of the test would be of objective type with multiple choice questions. The candidates should answer 120 questions in two hours. For writing entrance test, students should secure 50 per cent marks in qualifying examination for open category and 45 per cent for reserved category. The cut-off mark for qualifying is 30 marks general and for SC/ST there is no minimum mark. The convener said there were about 262 engineering college offering ME/MTech courses, 122 colleges offering M. Pharmacy courses and four colleges offering M.Arch course in Telangana State during academic year 2019-2020.